To be eligible for the Canadian Tire Contest Celebrating the Release of Disney•Pixar’s Cars 3, an individual must be a legal resident of Canada (excluding the province of Quebec) and be of the age of majority in his/her province or territory of residence or older. 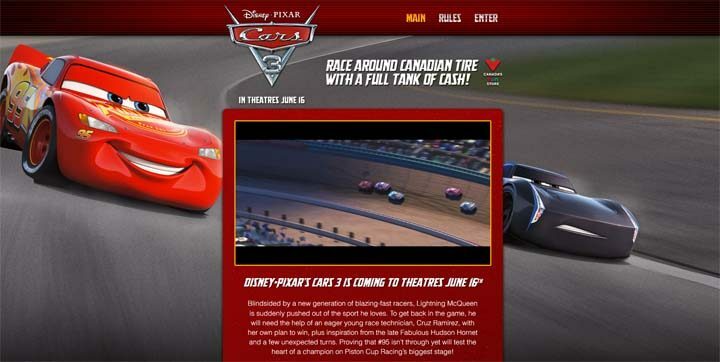 The Canadian Tire Contest Celebrating the Release of Disney/Pixar’s Cars 3 ends at 9:59 a.m. ET on June 19. Enter online, complete and submit the entry form located at promos.ytv.com/cars-3-contest. There is one (1) prize available to be won by the Prize winner consisting of a Canadian Tire gift card in the amount of three thousand Canadian dollars (CDN $3,000.00). We'd like to show you notifications for the latest Sweepstakes and Updates. One lucky entrant will win a Family Pack of Aunt Nellie’s products and a $900 VISA gift card. Limit one entry per day. American Eagle is giving you the chance to win a VIP Trip to the Governors Ball Music Festival in New York City. You can guess the ending of final series of Game of Thrones? Well if you can, you could be in with the chance to win a luxury Game of Thrones tour in Croatia. Vote for your favorite M&M’s flavour for a chance to win a trip to Thailand, Mexico and/or England. The Cheetos Mega Cheesy Ball Promotion is here. Enter for a chance to win $10,000.00. Win a Green Mountain Grill, 2 Tommy Bahama Custom Swill Chairs, a Custom Swill BBQ set, a Custom Swill Yeti Cooler & a Custom Swill Kids Chill Pool. Rules here. NBC Win $7,000.00 A Week For Life SweepstakesYou'd get $7,000.00 a week for life, then after that, someone you choose gets $7,000.00 a week for their life! PCH Million Dollar Money Booth Game Win up to $1,000,000.00!MONEY goes round and round and up to $1 MILLION could be found! Play Today! PCH NBC $15,000,000 Summer Prize EventENTER NOW : http://bit.ly/2wM2yq1 15 Million! It could be the prize of a lifetime ! Entering is free, so can you really afford not to enter ? PCH Win $50,000.00 to Drive Away in Your Dream Car GiveawayEnter for a chance to win $50,000.00 towards your dream car!